Val's cave paintings of the Puddle of the Bitter Water are the Alcañiz's most ancient human remains. In December, 1998 the cave art of the Arch Mediterranean of the Iberian Peninsula was included in the list of the World heritage. One of four more important deposits of Aragon is Val's Coat of the Puddle of the Bitter Water in Alcañiz's municipal area, key deposit in the study of the Levantine Spanish Art. This coat was found in 1913 by the pharmacist of Valdealgorfa, Carlos Esteban. To visit the paintings it must go away for ways that divide from Alcañiz (to 17 km) or from Valdealgorfa (to 12 km). 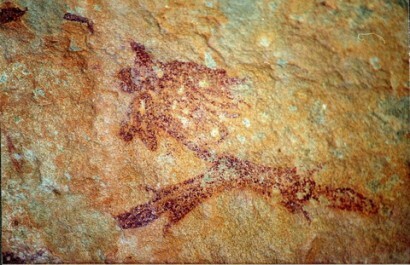 It is a question of a few cave paintings with more than 150 figures very spoilt before his recent restoration. The coat could be a place of meeting or "sanctuary" where there would take place ceremonies or the celebration of rituals of religious or social character. The represented topics give a special magic value for the activities of the hunt and the fecundity. For the year 2000 an emergency action was realized due to the evil been of conservation of the paintings. There were realized a cleanliness of vegetation, undergrowths and garbages of the environment; the sanded one of the railing and painted; restoration of the set; confection and placement in the platform of a table of interpretation on the deposit; placement of a cartel señalizador close to the access of the deposit; edition of a guide for his protection and social promotion. The shelter is an archaeological place declared B.I.C. also Mediterranean forms a part of the set of coats with cave art of the Arch declared by the UNESCO as World heritage. This way, the place enjoys the maximum protection that grants the Spanish and international legislation.